Have you ever wondered why people are attracted to certain colors? Or why your favorite color isn't universally loved by everyone you know? 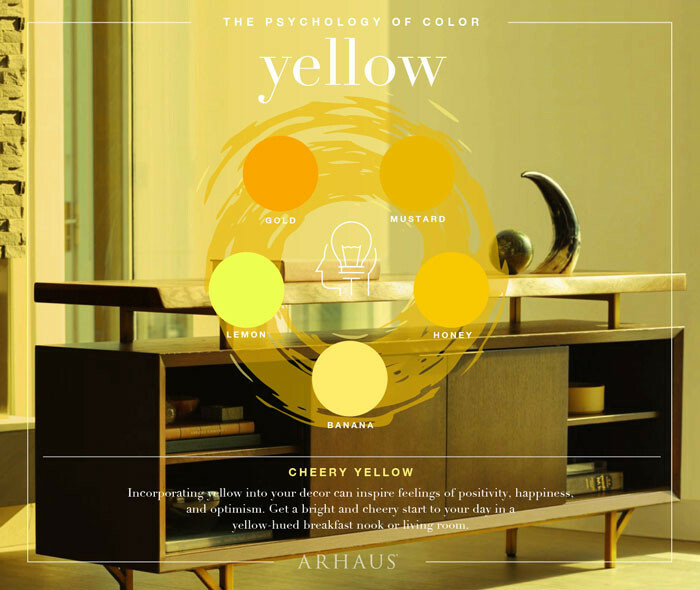 ​There are many psychological reasons behind why people are drawn to each color, and there are reasons why each color can serve a purpose in your home. Color can be used to enhance a mood in any room through the creative, thoughtful use of paint colors furniture, decor pieces and lighting. 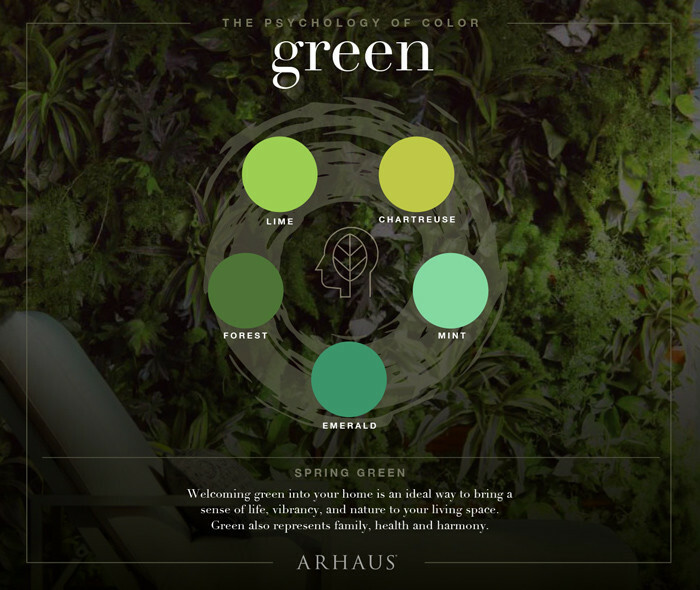 Check out the color cards below for a full experience of the psychology of color. 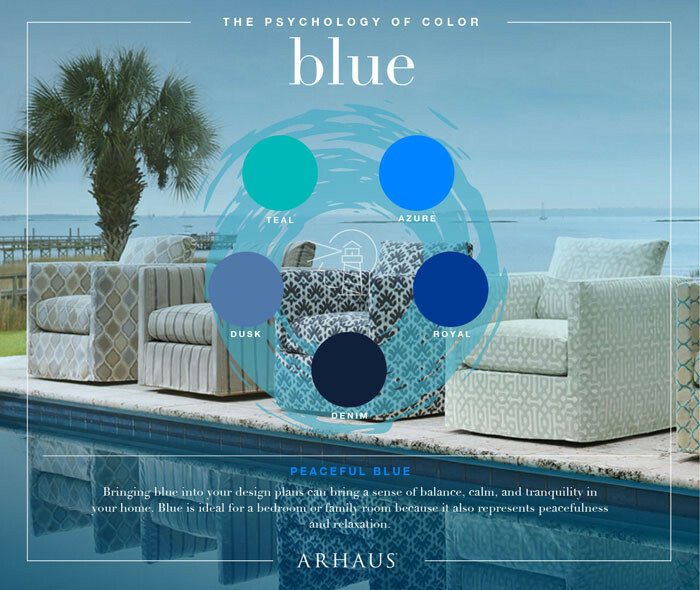 "PEACEFUL BLUE Bringing BLUE into your design plans can bring a sense of balance,calm and tranquility in your home. Blue is ideal for a bedroom or family room because it also represents peacefulness and relaxation." 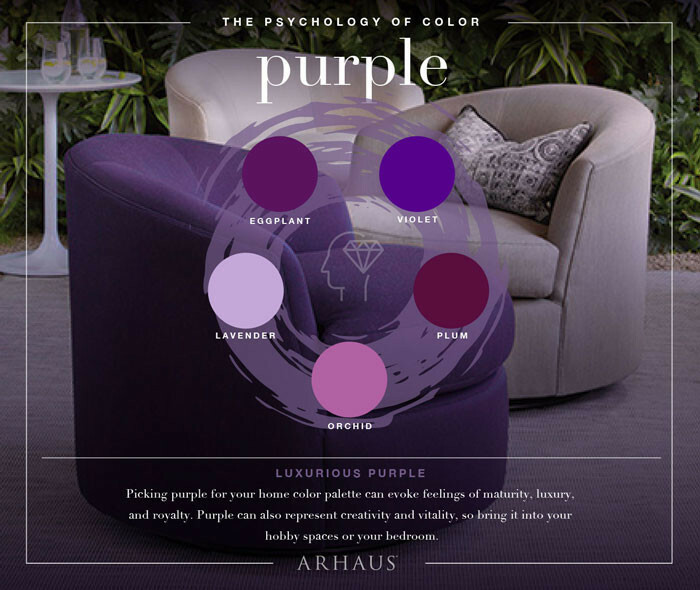 "LUXURIOUS PURPLE Picking purple for your home color palette can evoke feelings of maturity, luxury and royalty. Purple can also represent creativity and vitality, so bring it into your hobby spaces or your bedroom." "ENERGETIC RED Adding red into your home can evoke feelings of power, passion and warmth. 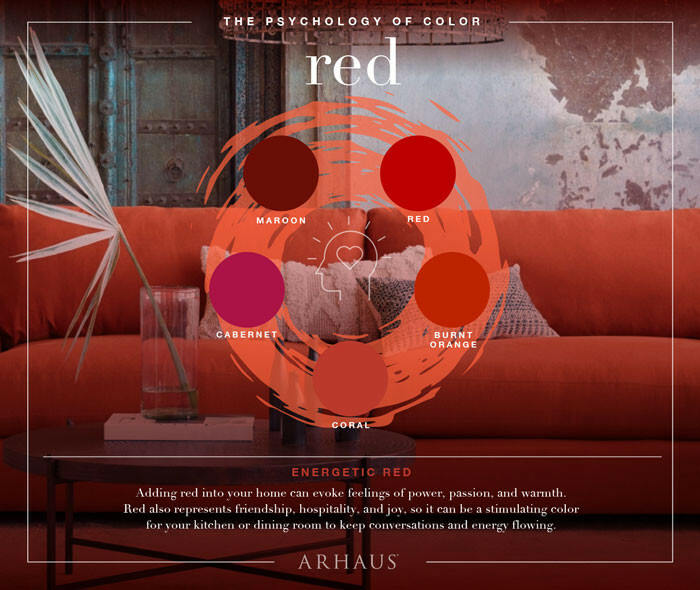 Red also represents friendship, hospitality and joy, so it can be a stimulating color for your kitchen or dining room to keep conversation and energy flowing." "CHEERY YELLOW Incorporating yellow into your decor can inspire feelings of positivity, happiness and optimism. Get a bright and cheery start to your day in a yellow hued breakfast nook or living room." "SPRING GREEN Welcoming green into your home is an ideal way to bring a sense of life, vibrancy and nature to your living space. Green also represents family, health and harmony." "EARTHY BROWN Incorporate brown into your home's color palette to add a sense of trust, reliability and unity. 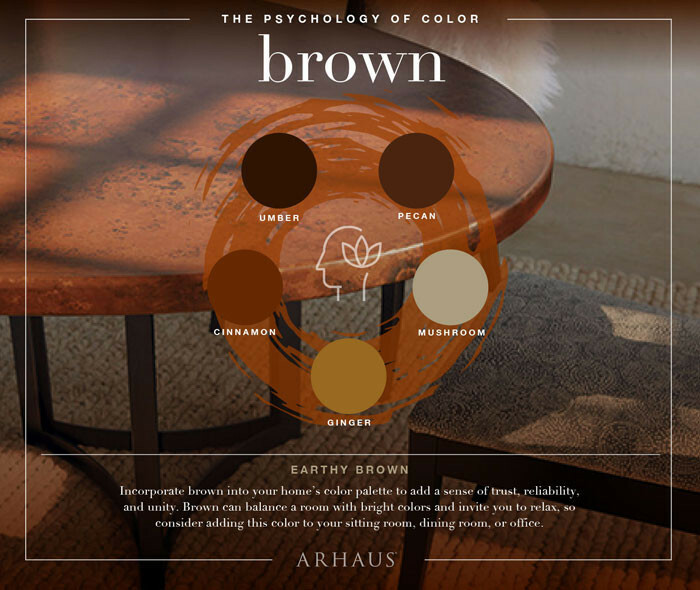 Brown can balance a room with bright colors and invite you to relax, so consider adding this color to your sitting room, dining room or office." 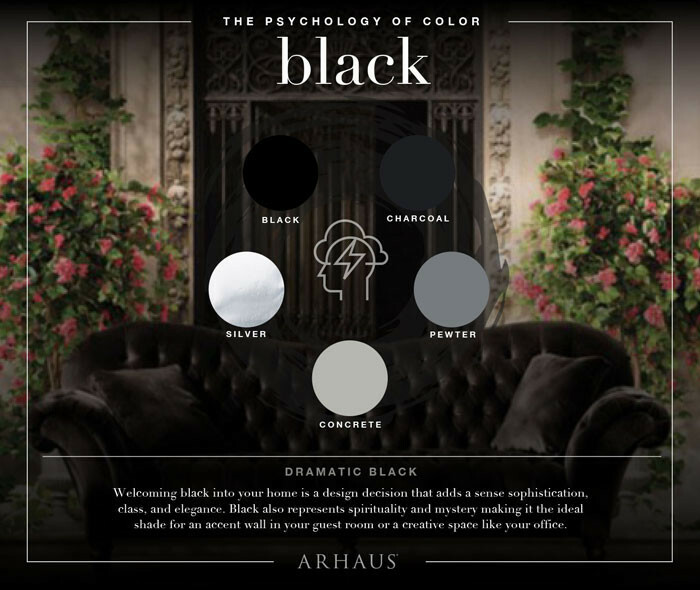 "DRAMATIC BLACK Welcoming black into your home is a design decision adds a sense of sophistication, class and elegance. Black also represents spirituality and mystery making it the ideal shade for an accent wall in your guest room or creative space like your office.